Disclaimer: Pirates for Parties in no way implies to claim any rights or any kind of affiliation with Disney and any trademarked or copyrighted characters including, but not limited to Captain Jack Sparrow, as well as any intellectual property pertaining to the motion picture/s "Pirates of the Caribbean” which are TM and © (or copyright) by Walt Disney, Jerry Bruckheimer and its related entities. This web site and its contents are in no way affiliated with Disney, or authorized or endorsed by Disney Corp, Jerry Bruckheimer Productions, Johnny Depp, or any of their subsidiaries. 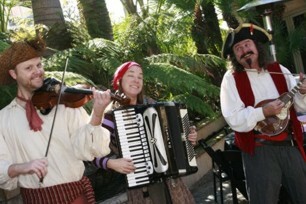 Pirates for Parties is not affiliated in any way, nor do they by fact or inference imply to hold any rights or authorization, rights of association or sponsorship or endorsement of the use of any copyrights or trademarks as held by any individuals, or companies in association with any offer, including, but not limited to Johnny Depp, Jerry Bruckheimer, Disney and its related entities. The contents of this site are © the site's owners, all rights reserved..
Pirates for parties sends pirate actors and entertainers in 1736 period clothing not costumes. 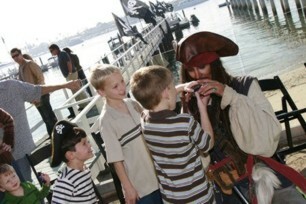 The pirate party experience is unforgettable for children and adults alike. 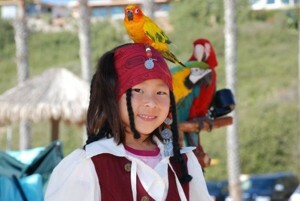 Combining comedy and adventure, Parrot Jack and the parrots of the Caribbean provide a safe hands on parrot petting, treasure hunting, swordplay experience that promotes personal growth for children and enhances eye hand coordination. 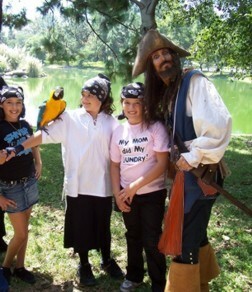 We have other pirates like Blackbeard, Captain Hook, and others. 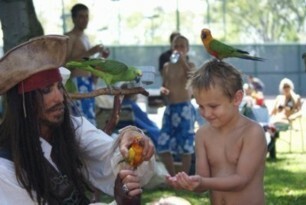 Hire a pirate with a Monkey.